We have now enabled support for filtering metric targets to be retrieved through AWS integration by tags. This can be used, for example, to exclude certain services from being polled in your development environment, achieving more efficient management. 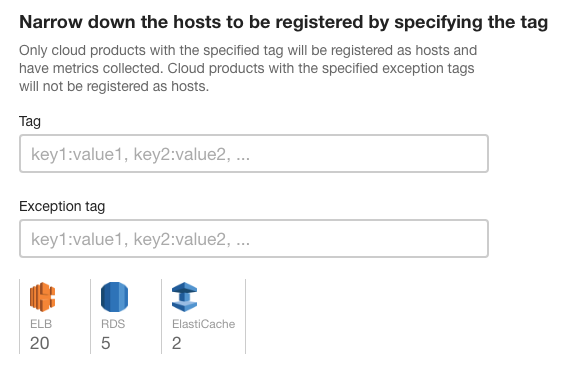 In particular, the AmazonElastiCacheReadOnlyAccess management policy on AWS cannot perform the elasticache:ListTagsForResource action, so when filtering ElastiCache by tag, the policy must be added. To add policies, use the Inline Policies process. For details, please refer to the Help manual. You can now use expressions in your monitoring rules. This allows you to flexibly monitor metrics by parameters such as the average value of role metrics, the difference between the current value and the same value a week ago, et cetera. The functions usable in expressions are described in the Help section below. We plan to revamp the editing functionality to make expression-based monitoring and expression-based graphs easier to input. Note that this feature is being offered on an experimental basis. Please see the Help section below for details on use of experimental features. Check monitoring currently sends an alert when the status or message changes. We are planning on changing this to only send alerts for status changes and to have only the alert details screen to update in the event of a message change. Since this is a change regarding monitoring, we are notifying users in advance of its release. We welcome your feedback regarding this change.